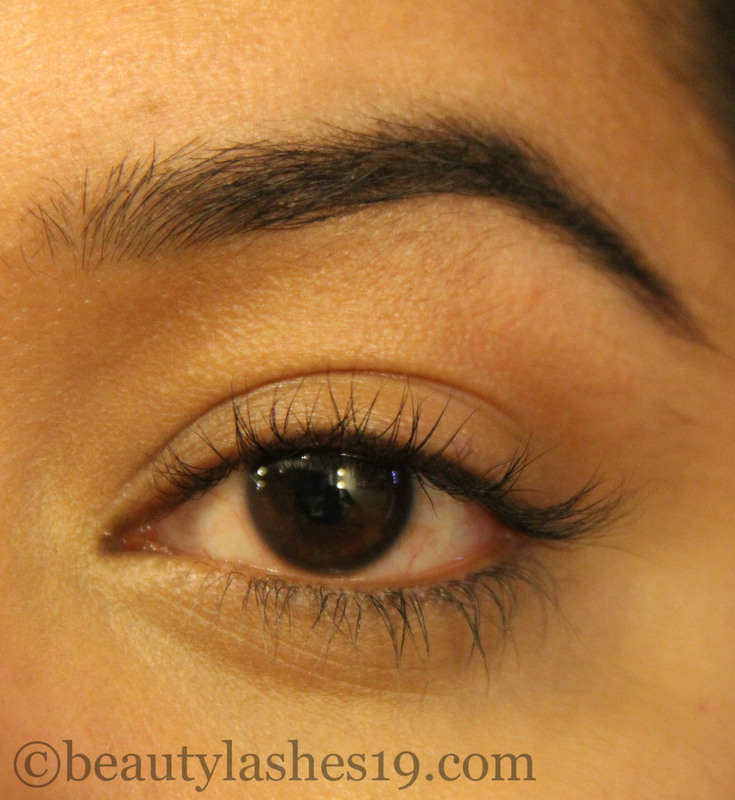 Hello everyone.. Today, lets talk about the Benefit they’re Real! 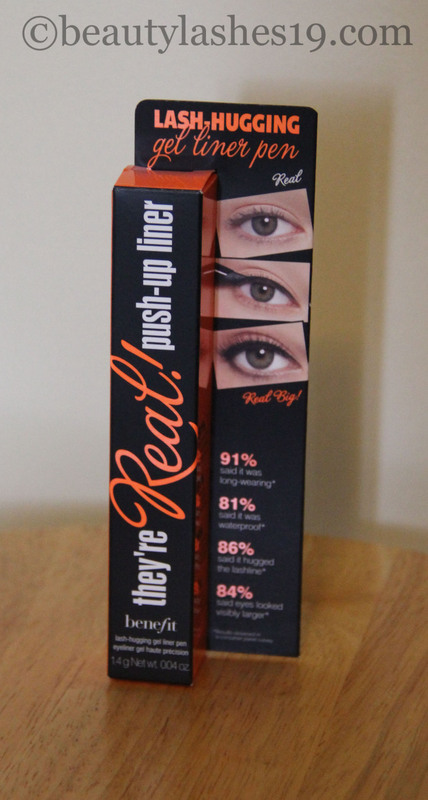 push-up liner.. It’s a product for which Benefit claims to have spent 5 years of research on.. With that many years of research, I sure would expect the product to be exceptional.. I purchased the push-up liner from Sephora and it cost me $24 for 0.04 oz of product.. The fact that the gel product is encased within the pen sure makes it very travel-friendly (in comparison with a typical gel liner in a glass jar and an eye liner brush).. The pen comes with a twist-off cap on the top.. The packaging is unique with an AccuFlex™ tip that helps draw an easy line.. The tip was covered with a tiny orange colored flexible plastic piece which ensured that air wouldn’t get in to dry out the product.. You need to take this off before using the product.. You can see a close-up of the AccuFlex tip in the image below.. It’s through that ‘hole’ that the gel product comes to the surface.. The shape of the tip sure helps to get lashes out of the way (especially good if you have thick & curly lashes like me) and this make application really easy.. Also, it helps to not constantly go back into another container to load up the tip – this saves some time.. The bottom of the pen has a twist-up feature which allows a small amount of the gel product to come out at the other end.. Before using it the first time, I have to at least do 20 ‘twists’ on the pen before I could see any product come through.. For application, I typically have to do one or two clicks per eye depending on the thickness of the liner I am going for.. The formula inside is quite thick and dry.. You do not get a wet feel on the lash line unlike a typical liquid or gel liner.. I personally have two problems with this pen.. Firstly, even when I do just one click/twist-up, I see that part of the formula that comes out tends to get dry and forms a clump.. Secondly, I am not able to get a thin line because of the dry formula of the gel.. For some reason, while I am spreading the product across my lash line, the pen accidentally creates a bumpy or uneven line.. As a result, I have to go back to try and make it smooth and end up with a thicker line.. and because the formula is smudge-proof, I am unable to rub it off with a Q-tip to correct it (unlike traditional gel liners which give me time to correct before they set).. So, I always end up with thick eye liner even when I don’t want to.. That being said, I am however able to get a sharp cat-eye edge with this pen (due to the shape of the tip).. 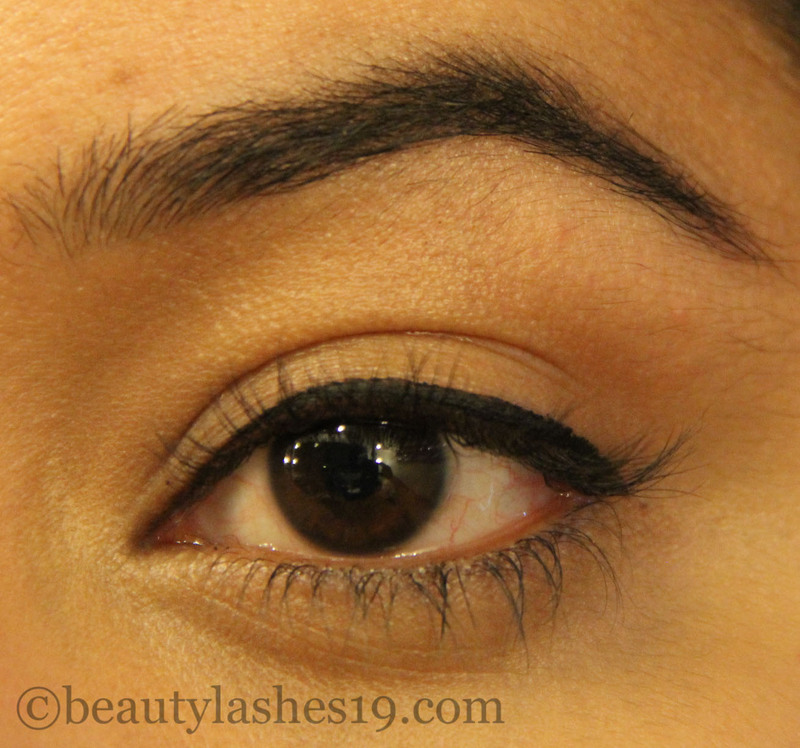 If a thick liner is what you prefer, this product might be a good option for you.. You can see in the images below what I am talking about.. 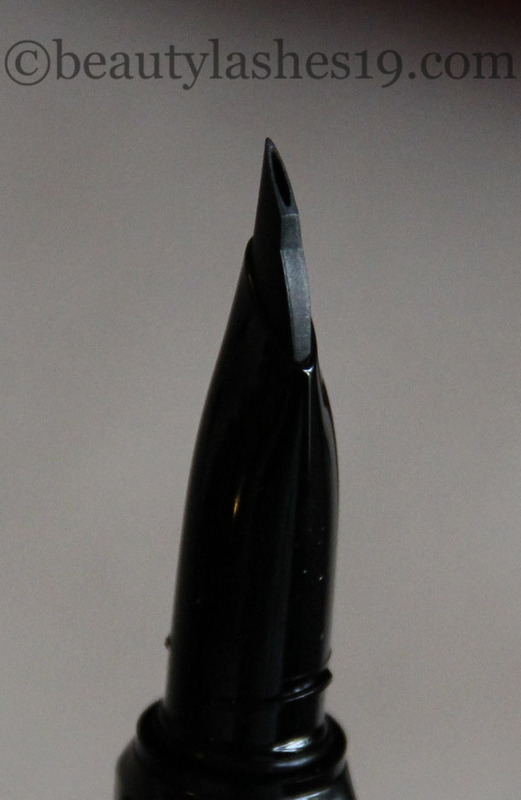 Image: This is the thinnest line I can achieve with this pen! 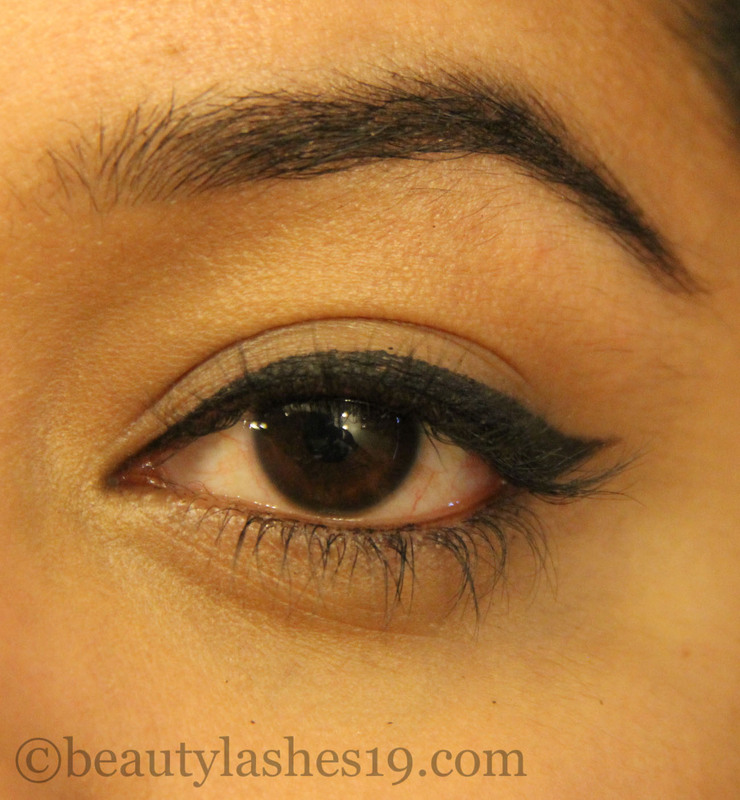 You can note that the edge of the liner is not smooth/crisp.. 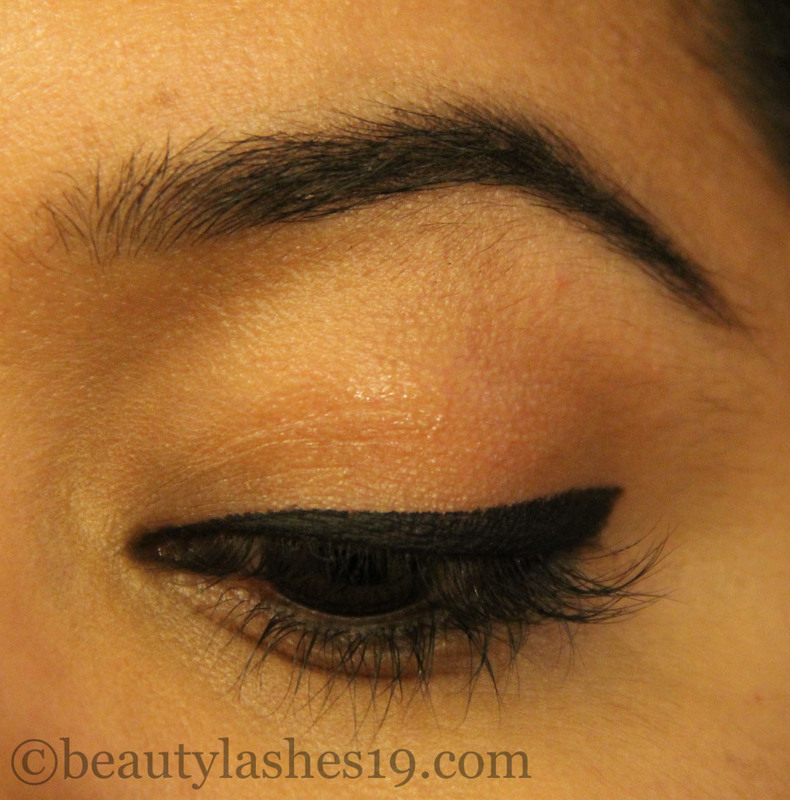 Image: After adding a small wing to the liner and thickening up a bit.. Drawing on the wing was easy with this pen due to the shape of the tip.. Image: This is the dried out clump and extra product that sticks onto the sides on the tip, getting wasted with each use! 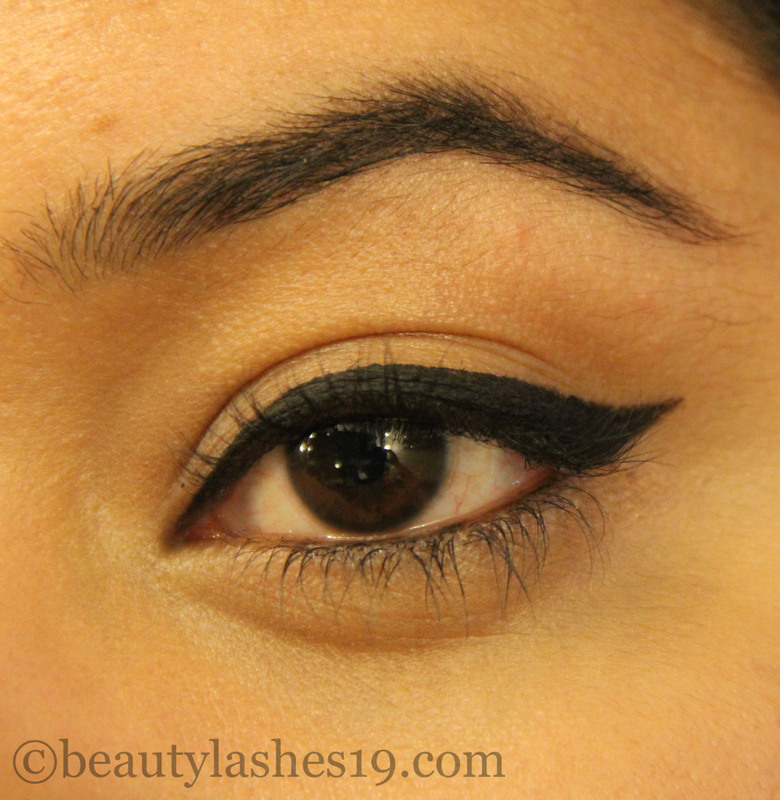 Images: Showing the eyeliner from different angles.. Looks quite decent.. 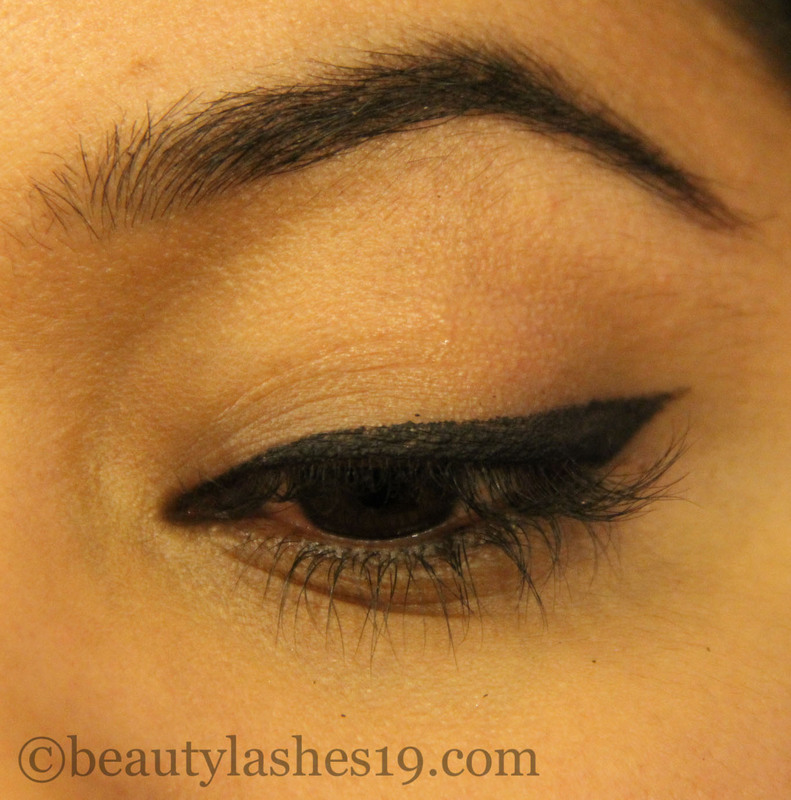 Images: Extending the wing.. Easy with the tip on the pen.. Also, I added whatever was left on the tip onto my lower waterline (just for fun :-))… Again, note the bumpy edge of the liner (I know I am quite picky but I really don’t like a bumpy edge ;-))..
As you can see here, I am unable to get a smooth edge to the liner because of the dry formula.. Also, you end up pulling the skin taut quite a bit for a smoother application due to the dryness of the formula.. I am personally not a fan of that.. It leads to premature wrinkles and who needs that!? When I spoke with the Benefit representative during the Sephora VIB Rouge event recently, she claimed that one pen should be enough for about 20 applications (for a liner with regular thickness).. This number would go down if you prefer a thicker line each time.. So, overall with respect to the cost of the liner, you would end up spending approximately $1.2 per application, which is quite steep in comparison to traditional gel liners! However, I have to admit that the formula is indeed matte black and is extremely waterproof and for the most part, smudge-proof.. 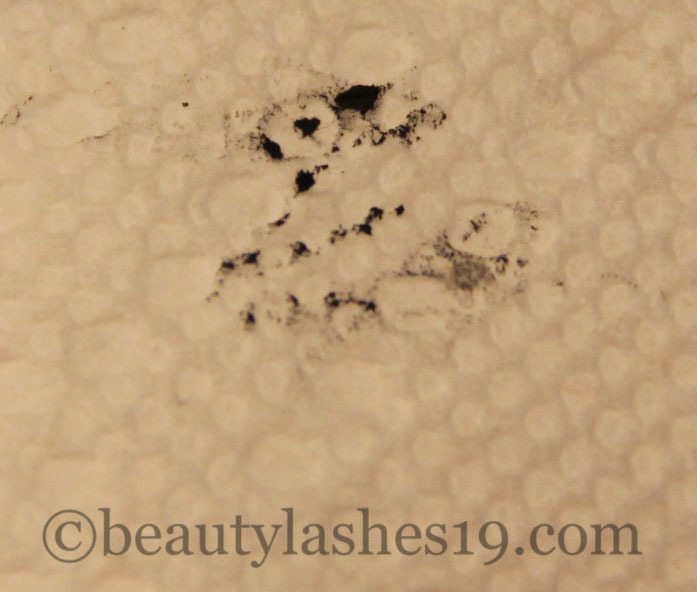 I tested this out by really smudging my eyes pretty hard.. See images below.. 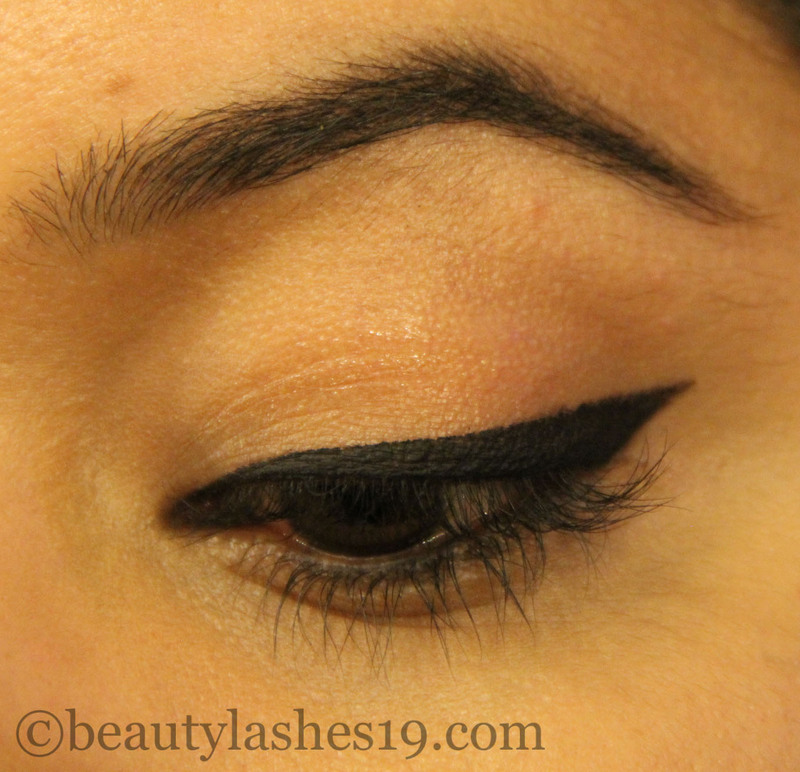 Image: You can appreciate that for the most part, the eyeliner stayed put! It doesn’t look like it was smudged much.. You can see tiny particles that came off onto the cheek bone.. That was it.. Very impressed with the smudge-proof and water-proof features.. 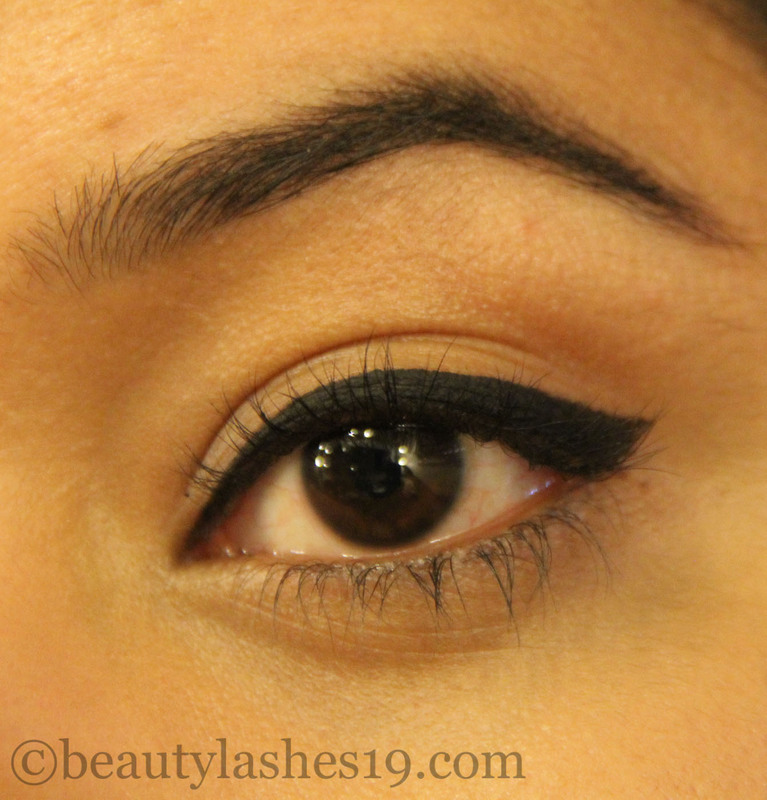 If you find that your usual gel liner has issues concerning lasting power or smudging throughout the day, you may want to try this.. Personally, I don’t rub my eyes very often and do not have issues with traditional gel liners.. What I have noted is that on my very oily eyelids, the eyeliner does seem to transfer onto the top of my lid fold when I end up with a thicker liner..
Because of its waterproof and smudge-proof properties, this product needs a waterproof makeup remover to get it off.. Bioderma Crealine cleaner was unable to remove this liner.. I had to use the Loreal waterproof eye makeup remover (dual layer one) to get this off.. I really think you’ll need a dual layer remover to get this product off.. It sure needs an oil to dissolve.. 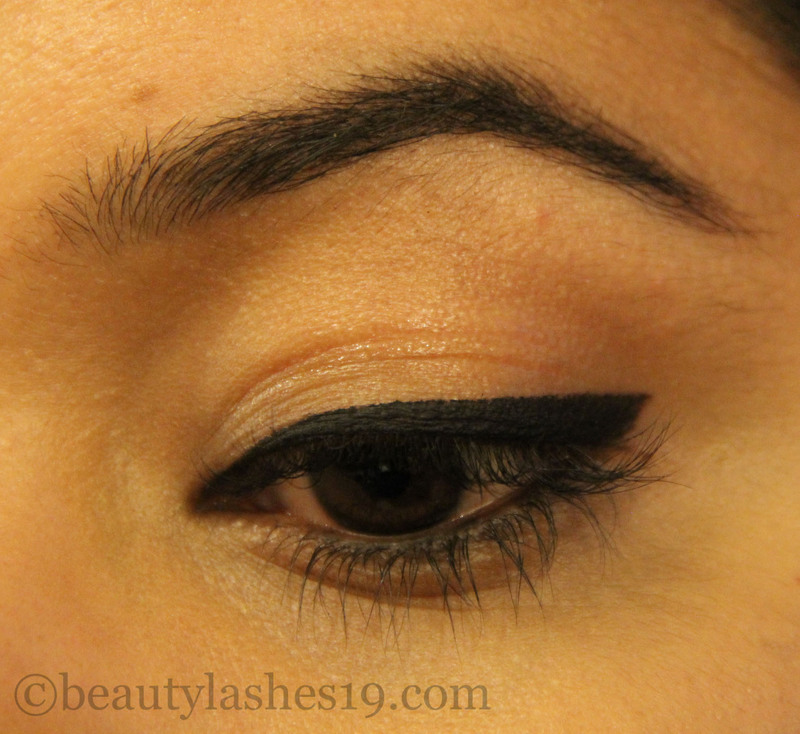 Overall, I much prefer traditional gel liners by companies such as Maybelline, Loreal, MAC, Bobbi brown or Illamasqua.. I can get a very precise line with these, in conjugation with an eyeliner brush and the products last me for a very long time (months to years)..
PROS: Nice, fine tip for a precise cat eye; water-proof & smudge-proof formula; you do not need to re-dip the tip to load up with gel; convenient for travel. CONS: Not worth the price considering its only for about 20 uses; end up with thicker liner than desired; gel tends to dry up very quickly and I end up with dry clumps resulting in wastage of product.